Ushio is a stock that hasn't enjoyed any material performance since the LDP took over last November. It is a prime candidate for stocks highly likely to outperform, as we find it unloved and undervalued. LCD-related names such as Ushio have been to the “Dark side of the moon” The Pink Floyd album title “Dark Side of the Moon” reminds us of the LCD industry, a lonely and dark place, but a bright sun on the horizon. We find the album’s song equally as appropriate as a nickname for Ushio (“Money”), a mid-size light source maker for semiconductor and LCD applications, which has net cash of over half its market cap and thus an undervalued going concern in our view. Experience the next "Great Gig in the Sky"! Ushio’s balance sheet is overflowing with net cash, gets a decent tailwind from the currency depreciation, and its stock has underperformed the market by 50% in the past year. The slowdown in DCP sales and LCD-related weakness has damaged the company’s prospects for near term profits. Investors tend to focus on DCP and non-cinema businesses at Christie, optical equipment (UX, EUV), and LCD-related products. Given Ushio’s large net cash position, the valuation for Ushio’s going concern appears to be too low given its exposure to new growth areas in EUV, LED, and chip packaging. PE is 16x FY3/14 EPS and 7x EPS after stripping out net cash. We initiate coverage with a LONG rating and target price of Y1,450, 44% upside. 1. Ushio will benefit from a large FOREX tailwind of approximately 2.5% of OP per Y1 move in FY3/14. 2. Order activity for LCD equipment appears to be picking up recently. 3. New products should increase traction in 2014. 4. EUV push forward will continue to increase the value of Ushio’s subsidiary Xtreme Technologies. A potential M&A of the sub is a distinct possibility in our view. Rival Cymer was just bought by ASML. Valuation is compelling as PBR is near a +20-year historical low. Ushio’s PE of 16x PE our FY3/14 EPS versus 26x for peers is also attractive. Ushio is an above average company regarding quality of management and track record, yet it trades at a discount to peers as well as a relatively low historical multiple. We also compare Ushio to peer companies in the semiconductor/LCD/lighting equipment industries including rival Iwasaki Electric (6924), fellow equipment maker Disco (6146), as well as LCD/semiconductor equipment peers Nikon, Tokyo Electron (8035) Dainippon Screen (7735), Ulvac (6728), and overseas peers Cymer and Barco. Ushio is a mid-size lamp and optical equipment maker with a market cap of Y131bn. Its key products are UV lamps for semiconductor and LCD production, digital cinema projectors for movie theatres, LCD production equipment, and chip packaging equipment. The firm boasts dominant market share in several of its key products, which has allowed it to above average OP margins over the past 20 years. Despite the global downturn in 2008-2009, Ushio remained profitable in every major product group, a tribute to its superior market share and cost control. By sales, Ushio’s main products are various lamps and equipment which feature light sources. Some of the main products are UV lamps, cinema lamps, data projector lamps, halogen lamps, DCPs, UV equipment, and UX-series gear. Halogen lamps and other conventional lamps and light sources are for daily illumination applications. These rather stable traditional businesses have allowed the firm to maintain positive returns on an operating level for the past 20 years, far more stable than its peers in LCD and semiconductor sectors. Products such as UV lamps are extremely high market share and command premium profit margins. As can be seen below, UV lamps have more than twice the impact on OP as sales. Cinema lamps are also high margin products. Three areas of special interest at Ushio are non-cinema sales, Xtreme Technologies, and UX-series products. Non-cinema products are mainly projectors used in simulation, control rooms, and virtual reality. Sales at Christie were growing rapidly in FY3/12. Applications include VE (visual environment) which is virtual reality and simulation for defense, shipbuilding, manufacturing industries. BP (business products) are control room displays, large venue projection mapping, etc. for infra, entertainment, broadcasting industries. Revenues were up 18% YoY last year and should continue at 20% CAGR for several years. Profit is similar to other cinema business, and R&D spending should be limited going forward as they already invested quite a bit in non-cinema. Rivals are Barco (Belgium) for high-end products and Panasonic in low-end (BP). Sony and NEC don’t have much presence in non-cinema businesses..
Xtreme Technologies, Ushio’s subsidiary, makes EUV light sources for semiconductor lithography. Xtreme competes with USA Cymer in EUV light sources. The main customer is ASML. ASML’s NXE 3100 uses 1 Xtreme light source at IMAC for R&D purposes. Roadmap for EUV is about 2015-2016 for production, but Intel’s recent investment to ASML’s EUV program could accelerate development and mass production of EUV tools and semiconductors. Last year Intel committed $333 million to ASML for R&D in EUV lithography. Meanwhile, ASML announced it will take over Cymer late last year. The impact of ASML purchase of Cymer isn’t clear, but Cymer’s technical hurdles with EUV continue despite ASML’s endorsement. Xtreme appears to have the edge in duty cycle while Cymer had the higher wattage last year. Cymer has achieved 50 watts at 40% duty cycle. Ushio achieved 45 watts at 100% duty cycle recently and 51 watts at 80% duty cycle. At the International Symposium on EUV Lithography held in Belgium in October, 2012, Ushio made an announcement of stable operation on the EUV light source for the past half year at IMEC (Belgium), experimental results of high output power up to 74 watts, and verification of feasibility of 250 watt output power. 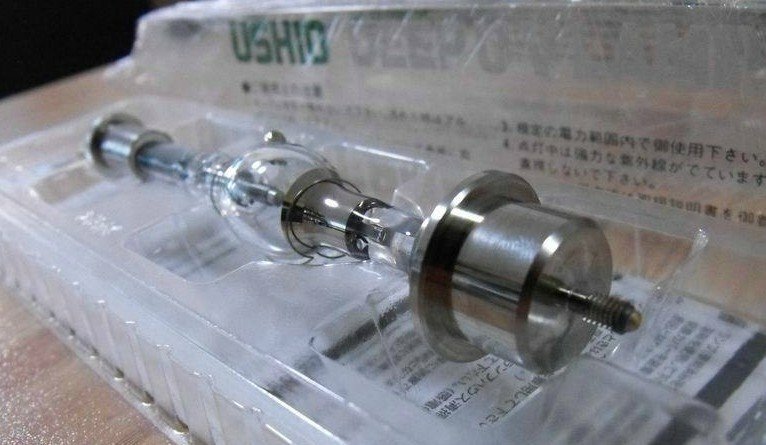 Ushio will continue promoting DPP (Discharge Produced Plasma) EUV light source. UX-series products are used in semiconductor packaging. In Ushio’s UV equipment segment, sales were Y3.7bn in Q4, half of which was UX sales. UX-4 units for LED packaging in the illumination application are still soft this year, but UX-5 for CPU packaging (mainly Intel direct wire bonding for CPU) should see more activity next year. ASPs for both tools are Y0.2bn for revenues this year of Y6bn. Profit margins appear to be higher than average for UX series. UX-7 was recently released for TSV, etc. and is focused on 2.5D and 3D packages, and should be shipping in spring 2013 for CPU, DRAM and other device makers. There are about 10 clients currently. Ushio expects several units to ship in FY3/14 with 1 unit priced at about Y0.3bn. Strengths: Ushio is arguably the market leader in cutting edge light sources for semiconductors, LCDs, and other technology applications. This technological lead has allowed Ushio to capture top shares in many areas including UV lamps, cinema lamps, data projector lamps, etc. Ushio boasts a dominant 80% market share in highly profitable UV lamps for LCD, semiconductor and electronics applications. The firm manufactures various light sources such as halogen lamps, metal halide lamps, and discharge lamps for more conventional domestic applications in illumination for buildings, autos, etc. Although the margins are lower, demand is stable and reliable and Ushio enjoys a strong brand name in these sectors. Ushio has a very strong balance sheet with Y78bn in net cash including long-term investments. Ushio’s market cap is Y132bn, and thus the implied market value for its operations is only Y55bn, or about 7x EPS. We forecast net cash level to rise above Y100bn next year, the first time since 2007. Ushio’s share price broke through Y3,000 in 2007 and now trades at the Y1,000 level. Ushio’s strong balance sheet allows it to invest aggressively in R&D for new products. Opportunities: EUV for next generation semiconductor lithography is one of Ushio’s new products with large potential payout on the horizon. Ushio’s subsidiary Xtreme Technologies competes in a 2-horse race with Cymer in EUV light sources. Ushio has a decent track record in semiconductor lithography in UV lamps and Gigaphoton, its ex-subsidiary with Komatsu. Xtreme’s prospects for high profits are quite attractive in our view. Ushio’s digital cinema projectors for US movie theatres have undergone explosive growth in the past 5 years. Growth of DCPs has slowed, but Ushio’s sells cinema replacement lamps for DCPs, which is growing rapidly on the back of higher DCP installed base. Ushio makes semiconductor packaging equipment called UX-series products, which are a relatively new product line-up and growing quickly as well. As mentioned above, Ushio’s large cash position allows it to search for new profit streams for the firm. The cash also could allow Ushio to increase dividends or share buybacks. Ushio has consistently paid high dividends and bought back shares, paying a 2.4% yield last year and buying back 1.1% of its shares. Weaknesses: Ushio also supplies manufacturing equipment such as curing and excimer cleaning gear for LCD production, which utilizes its core light source technologies. LCD capex tapered 2 years ago as LCD panel makers’ profits collapsed. Given the few number of large panel players, capex spending is naturally unpredictable. Although there is strategic capex in small displays, large capex should be mundane as TV and PC demand is soft. DCP units have reached a fairly high level of penetration in the US and Europe after several years of high growth. Although demand is still strong for DCP units in China and emerging areas, the high growth era is over in our view. As mentioned above, Ushio has a cash-rich balance sheet, which has its advantages. However, it also prevents it from maximizing ROE and shareholder value. Threats: UV lamps for semiconductors were a strong growth driver 10 years ago until recent times, but a shift from UV to laser technology has phased out UV lamps in semiconductor steppers to some degree. Semiconductor UV lamp demand is falling while LCD UV lamp growth is rather mundane as well. DCPs are slowing to -14% growth this year from +50% growth last year. A risk is further slowdown in unit shipments, although the replacement demand for cinema lamps mitigates the DCP unit slowdown somewhat. 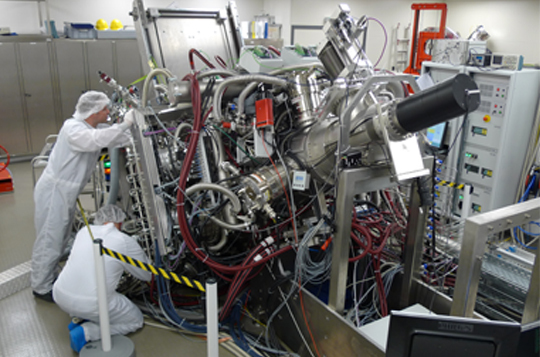 Other potential threats include rivalry from Cymer in EUV light sources, a key area for Ushio. Cymer’s costs have shot up significantly recently as it accelerates its EUV R&D, which has hurt its margins. The risk is pressure on Ushio to invest in expensive R&D without a guarantee of future profits in EUV. However, Intel’s recent investment in ASML’s EUV technology provides assurance that chipmaker’s will adopt EUV sooner rather than later. UV lamps, which were 12% of sales the past 3 years, are high margin and a large earnings driver. Ushio is the dominant UV lamp supplier with 80% WW market share (for both semiconductor and LCD steppers). Recently, LCD applications have overshadowed semiconductors as the core growth driver for UV lamps. Five years ago, LCD and semiconductor UV lamps ratio was about one-to-one, but currently LCD lamps are about double semiconductor lamps in revenues. Semiconductor steppers, which utilize lithography technology to transmit circuit images on to silicon wafers, are shifting light sources from UV lamps to excimer laser light sources, which have shorter wavelengths. This allows for narrower line widths in the silicon circuitry. The current installed base of UV lamp steppers (i-line) still exists amongst global semiconductor producers, but growth in installed base of i-line steppers has flattened in recent years. We expect the installed base to eventually erode to excimer laser steppers (KrF, ArF) in future years. Thus, semiconductor-related UV lamp demand should be directly tied in to chip utilization rates. LCD steppers, however, do not utilize laser technology, as the light wavelength is a less important issue. Thus, if the LCD production utilization recovers, we expect Ushio’s LCD UV lamps to increase sales as well. UV lamp sales were down 11% YoY and flat QoQ in Q3 of FY3/13 owing to lower production of PC and TV panels at LCD makers. We believe that the LCD environment will improve slightly in CY2013 for Ushio as LCD volumes recover. Last week, Corning, the largest LCD glass maker, forecasted 5-10% LCD TV unit growth and 10% PC unit growth (including tablets) for CY2013. Ushio’s consolidated subsidiary Christie Digital Systems’ digital cinema projectors (DCPs) were extremely high growth last year with unit growth of 52% in FY3/12. Unit shipments of projectors were over 10,000 units versus 6,600 units in FY3/11. We project units to fall by 15% YoY to 8,700 units this year owing to high penetration in Europe and the US. On the other hand, cinema lamps should grow 10-15% this year as DCP lamps replacement demand drives sales. We believe that Christie has a large 70% market share over rivals Sony, NEC, and Barco. Sony is a competitor, but also uses Ushio’s lamps in its projectors. New markets include Europe, France, Asia, and Japan where competitors such as Barco, Sony, and NEC have a heavier presence, but Christie is the only company to have significant experience in the cinema industry. Total screens WW are approximately 75,000, in which Christie has shipped about 25,000 units to date. Hence, the penetration rate for the DCPs is 35% for Christie only. 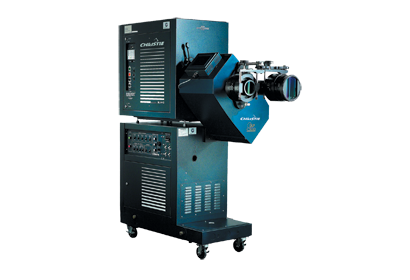 Two positive catalysts for DCP is the organic growth of cinemas in Asia and emerging markets and the natural increase in replacement demand for DCP lamps. 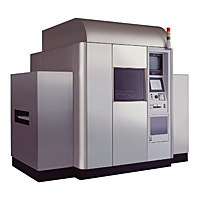 Ushio’s subsidiary, makes EUV light sources for semiconductor lithography. Unlike its ex-subsidiary Gigaphoton, Ushio has chose to go it alone against Cymer in EUV. The roadmap for mass production via EUV was thought to be 3-4 years in future, but Intel’s recent investment to ASML’s EUV program could accelerate development. Intel announced on July 9 that it will commit $333 million to ASML for R&D in EUV lithography. We don’t factor in to our model potential profits from Xtreme yet, but it is conceivable that the business will contribute significantly to earnings in 2014 and after. We think that the Gigaphoton experience is a solid example of Ushio’s prowess in litho light sources. Ushio established Gigaphoton with Komatsu in the 1990’s as a 50% owned equity-method company. Gigaphoton had robust sales and net profit and was a major contributor to equity method earnings with approximately 8% of total net profit in both FY3/07 and FY3/08. Sales in FY3/07 and FY3/08 soared for excimer lasers to stepper makers, rising 78% YoY and 55% YoY. Gigaphoton gained market share from number one player Cymer (USA), which had the top share at about 60%. Cymer used to dominate the market with a virtual monopoly before Gigaphoton was officially created in 2000. Cymer and Gigaphoton are the only 2 laser light suppliers for excimer Kr2 and Ar2 steppers. UX-series products are used in semiconductor printed circuit board (PCB) production. UX-4 units are for LED packaging which have been in decline, but UX-5 should rise sharply for CPU packaging (direct wire bonding for CPU). We believe that UX-5 sales were 4 units last year and 20 units projected for this year with high profit margins. LED capex is sluggish currently as LCD backlight capex in past 2 years was strong, but general illumination LED capex is an attractive new sub-application for UX-series. The forex impact is Y0.2bn for every Y1 move against the $USD for OP, and Y0.3bn for RP. Some of Ushio’s dividend income in non-operating income are based in $USD, which increases RP when the yen depreciates. Much of the $USD exposure is through Christie’s DCP business, which is based in North America. The tailwind from the currency in FY3/14 is significant, with approximately 52% upside in RP and 42% upside in OP if yen remains at Y98 to the $USD. Non-operating income is unusually high for Ushio given its holdings in equity method subsidiaries. Ushio also has Y48bn in investment assets, which tend to yield above average interest income and investment gains. In FY3/12, OP decreased after a rebound in FY3/11, owing to a slowdown in LCD-related equipment and UV lamp sales. We predict that margins recover as a weaker yen raises profitability overseas while the core businesses recover overall. Cash level and investment assets fell in FY3/09, but Ushio reversed that fall in FY3/10. The past 2 years net cash level has remained fairly flat owing to higher capex outflows. In the past 10 years, free cash flow has been overwhelmingly positive, falling only slightly in 2 of 10 years. This is a tribute to Ushio’s stable profits and relatively lean cost structure. The shares have underperformed the TOPIX by 50% over the past year. On PE and PBR metrics, Ushio’s stock is undervalued, in our view. PBR is 0.8x, an all-time low and far below the 10-year average of 1.6x. PBR very low at 0.8x when considering that Y50bn in net cash and market cap of only Y132bn. PBR is below the average of Ushio’s peers in Japan, but we believe Ushio’s future earnings prospects are far greater than its peers. Ushio’s PE is 17x FY3/14 EPS is also below the average peer PE, but Ushio has far more net cash than its peers, and thus PE for market cap without net cash to earnings is 7x EPS. Please refer to the peer comparison chart below for full details. Historical PBR (X) 10 yrs. Upon close inspection of Ushio’s PBR over history, the stock is very attractive in our view. Ushio’s stock has bottomed at 1.5x estimated book value 4 times in the past 14 years, mainly during bear stock markets. (The exception is last year during the financial crises.) For example, the last 2 occurrences before 2008 were 1998 and 2003, which was during the bottom of the Asian crises in 1998 (October, 1998) and the Nikkei all-time low in March, 2003. Given the earnings recovery projected for this year and next, we find trough level price as undervalued. Furthermore, we forecast a ROE of 7.4% in FY3/14, significantly better than the 10-year lows of 1.6% and 2.3% in 2002 and 2009. Our fair value is ¥1,450, 24x our EPS, 14x EPS + net cash and securities on Ushio’s balance sheet, and 1.2x PBR. For reference, Ushio’s peer average PE is 26x for next year. We note that Ushio has a comparatively high level of share buybacks. In the last year, share buybacks have amounted to 1.5 million shares for a 1.1% reduction in shares outstanding. In addition, Ushio has steadily increased its dividend payout and yield from a 0.8% average yield from 1995-2004 to a 1.2% average from 2005-2009 to a 2.3% average in 2010-2012. Last year the yield was 2.2% and we forecast 2.5% for next year.